The concept of electric fields can be difficult to visualize, but the Dry Field Mapping Kit makes it easy. Using the provided conductive paper, a student can draw any electrode configuration and then connect the electrodes to the battery power source included with the kit. The battery provides current to the paper, and the potential difference (voltage) can be measured between two points using a multimeter (sold separately). On a separate sheet of paper, students record the voltages and locations to reconstruct a visual of the electric field. 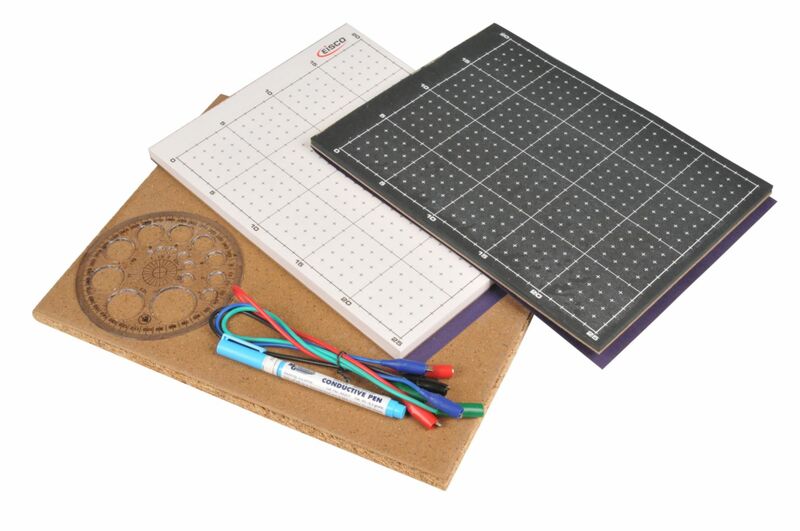 Ordering information: This kit includes a cork-covered base (30 x 26 cm), pad of 25 sheets pre-printed conductive paper (28 x 21.5 cm), pad of 100 sheets preprinted paper for drawing fields, 10 metal-headed push pins, a silver conductive pen, four alligator clip leads, and circle template.